What is the hook angle on a saw blade? 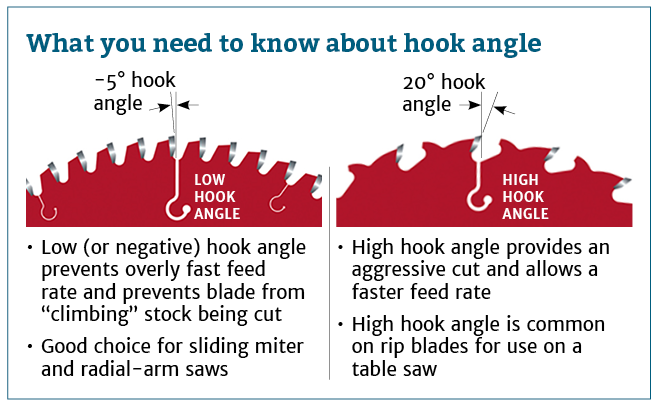 One of the specs listed on saw blades is the hook angle. What does this mean, and when would you choose one over the other? The hook angle refers to the angle at which the teeth will engage the material being cut. A high or positive hook angle means the outermost tip of each tooth will engage very aggressively, whereas a low or negative hook angle causes each tooth to take a less aggressive bite. How do I choose a blade based on hook angle? Use a blade with a negative hook angle for tools that make climb cuts, such as radial arm saws. A radial arm saw is more difficult to control and will try to cut faster than you want it to, if the installed blade has a positive hook angle. A negative hook angle is also useful for cutting certain materials such as metal on a table saw. Use a blade with a positive hook angle for faster, more aggressive cuts, such as ripping boards on a table saw. Not the answer you're looking for? Browse other questions tagged safety table-saw tools saw-blade radial-arm-saw or ask your own question. Is a climbing cut on a table-saw ever justified? How effective are different types of saw blades for various cuts and woods? How do I look for a table saw blade with non-angled teeth? Is there a collection of good reference signage for saw blade types? What should I do to maintain a saw blade? What is the right blade for my old, cheap jig (sabre?) saw?